CORTINA, Italy – Vail’s Lindsey Vonn smashed yet another record on Saturday in Cortina, winning her 37th World Cup downhill and the 74th race of her career. On the track where Vonn broke the all-time World Cup win record last season, Vonn battled wind to take the win and break Annemarie Moser-Proell’s record of 36 downhill wins. 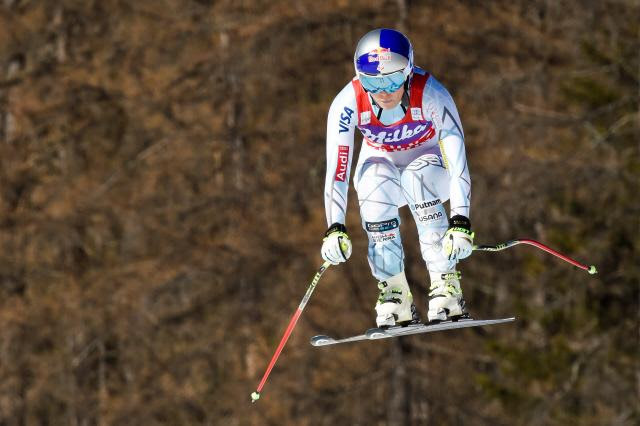 It was Vonn’s 10th career win (downhill and super-G) at Cortina. This newest title means Vonn is the winningest woman in downhill skiing. Her next focus would be to beat Ingemar Stenarmk’s World Cup win record of 86, however, Vonn chooses to concentrate on ski racing. It looked like Vonn was going to take the win by a large margin, but fellow North American Larisa Yurkiw of Canada reproduced her best World Cup result to take second, just .28 seconds off of Vonn. Switzerland’s Lara Gut, who holds the World Cup overall lead, was third. Vonn’s win moved her to within 10 points of Gut’s overall World Cup lead. It was a steep and fast course with many of the ladies making mistakes, but three USA ladies were able to grab points. Stacey Cook (Mammoth Mountain, CA) was 15th, Laurenne Ross (Bend, OR) 19th and Jackie Wiles (Aurora, OR) 30th. Alice McKennis (Glenwood Springs, CO) was 35th, Breezy Johnson (Salt Lake City, UT) 37th and Anna Marno (Steamboat Springs, CO) 38th. Next up, the ladies race super G in Cortina on Sunday. Lindsey Vonn took her 74th World Cup win and her 37th World Cup downhill win, breaking Annemarie Moser-Proell’s downhill win record. It was Vonn’s 10th win in Cortina and seventh win in the 2015-16 season. Larisa Yurkiw of Canada was second and Lara Gut of Switzerland was third. Vonn tied Moser-Proell’s downhill win record in Altenmarkt-Zauchensee, where Yurkiw was also second. The race struggled with wind and fended off delays throughout the event. Vonn trails Gut for the overall World Cup by 10 points. Vonn leads the downhill standings over Yurkiw by 122 points. I think there was a lot of pressure. The more people talk about the record, the harder it is to break them. I try to stay focused on my skiing. I thought I skied really well on the top—I went a little too straight on the bottom, but was able to pull it off. It’s always tricky with these conditions—the wind was going back and forth. Some people got headwind; some people got tailwind. I’m just really happy to come away with another win and another record. It’s an outdoor sport. You can’t control the conditions. But thankfully I was able to overcome it and come away with another record. I’m trying not to think about it too much because otherwise I’ll get distracted, but tomorrow is another race and hopefully another chance to win. I need to just focus on tomorrow—one day at a time, one race at a time. I can’t start calculating the numbers because it gets into my head. It makes it harder than it needs to be. I just need to ski solid and not have any mistakes. Then the results will come and the records will come. You can’t put the cart before the horse. I love Cortina. It’s the place I got my first podium. Last year, breaking the overall wins record—that was incredible. My sister is here today and a lot of the tech girls are here, which is really nice. I don’t think I’ve ever had tech girls come to watch me ski a speed race, so that was something special for me. Of course, all my teammates on the speed side are really supportive too. It was just another perfect day in Cortina.